Citation: Siefken, K., Schofield, G., Malcata, R. Engaging urban Pacific women in healthy lifestyle behaviour: an outcome evaluation of a workplace-based physical activity intervention in Vanuatu. Journal of Sport for Development. 2014; 2(3). Background: The epidemic of chronic diseases is threatening the health and wealth of the South Pacific region. This study is a response to the need for evidence-based solutions in increasing physical activity and healthy eating in the region. The first Pacific physical activity intervention that has been evaluated is presented. Methods: A team-based 10,000 steps challenge was monitored over a 12-week period targeting female civil servants (N=207) in Port Vila, Vanuatu. A sub-group analysis was conducted, examining low- and high risk individuals. Clinical inferences were based on the span of 90% confidence intervals in relation to thresholds for small, moderate and large effects of as 0.2, 0.6, and 1.2 of the standard deviation of the pooled sample. Results: A mean step increase from baseline to follow-up of 2,510 ± 6,922 steps was observed (+26.1%). A change in waist circumference (cm) showed likely beneficial small effects (-3.9 ± 10.3). High risk individuals benefitted most from the intervention: beneficial effects were found for PA behaviour (steps; large, +229%), waist circumference (cm; moderate, -6.2%) serum glucose (mmol/l; small, -15.9%) and triglycerides (mg/dl; moderate, -31.%). Conclusion: The programme was successful in increasing PA levels and in reducing NCD risk factors in high risk individuals. Health infrastructure across the Pacific region is often poor and there is a shortage of appropriately trained health workforce, particularly in the field of health promotion.11 Under-diagnosis of NCDs and under-treated costs are projected to rise sharply with increasing awareness of chronic disease complications.5 Importantly, average treatment costs of NCDs are considerably higher than non-NCD admissions in the country.12 The prevention of lifestyle diseases is distinctly important where health services, diagnosis and treatment opportunities are limited. Various strategies have proven effective to engage individuals in PA. For example, research indicates that pedometer-based programmes can help increase PA behaviour and may reduce NCD risk.21 Hatano suggests that the accumulation of 10,000 steps per day is comparable to achieving 30 minutes of PA per day.22 The 10,000 steps message is an approach of PA promotion that initially came from researchers in Japan two decades ago, and this approach has become a popular tool for PA promotion internationally. The Pacific Guidelines for Physical Activity suggest using a pedometer to monitor PA behavior.23 The 10,000 steps message from Japan is therefore considered an appropriate tool in this context. Whilst Pacific Physical Activity Guidelines exist,23 the lack of research regarding PA behaviour limits the evidence on how to engage the Pacific population in PA behaviour. It is unclear whether a) Pacific people would respond to pedometer-based PA interventions and b) whether interventions reduce NCD risks in this population. However, no pedometer-based study has been conducted in a region where walking forms part of the daily routine and is used as a means of transport and leisure-time PA.
A great number of pedometer data from HICs is available,21,24 but little is known about step data from low- and middle income contexts(LMICs).25 This study can be a first step in closing the gap and also in contributing to the collection of step data from a LMIC context, as encouraged by Cook.25 Pacific PA research is in its infancy and if findings from this study are brought on to relevant stakeholders (i.e. Secretariat of the South Pacific, World Health Organization, AUSAID) they may invest in additional population-based step count collections, as called for by Cook. Workplaces have been shown to be an effective means of promoting PA behaviour.26,27 Workplace environments may affect the health of the employee, their families, communities and societies at large.28 Whilst systematic evaluations are available from a number of workplace health programmes in higher income countries, there is a paucity of workplace health evaluations from LMICs. Overall, very little step data is available from LMICs.25 Whilst some pedometry data is available from Africa25 and Brazil,29 these data have not been collected in workplace settings and do not indicate PA levels of urban employees. The Ottawa Charter for health promotion and the World Health Organization’s (WHO) ‘healthy workplace settings’ approaches provide the conceptual basis for the approach taken.30 Prior to this study, formative research investigated barriers and facilitators for healthy lifestyle behaviour and sought participants’ suggestions for programme content. A team-based pedometer challenge, accompanied by social marketing and health education tools, was implemented and monitored for twelve weeks between April and June in 2011. The purpose of this study was to evaluate a PA programme that was designed for Pacific women in urban Vanuatu. Presented below is the first systematically evaluated workplace health intervention conducted in the Pacific. Participants were not randomly chosen from the population, but were recruited and sampled through the Ministry of Health Vanuatu. All female civil servants were officially invited via email invitations to attend the official opening in March 2011, which was launched by the Director of Public Health. A total of 207 female individuals were recruited; 189 individuals (91.3%) were from the Vanuatu Government sector (Correctional Services (9), Department of Youth and Sports (4), Magistrate’s Court (8), Ministry of Agriculture (14), Ministry of Customs (5), Ministry of Education (29), Ministry of Finance (33), Ministry of Health (14), Ministry of Justice (6), Ministry of Labour (6), Ministry of Lands and Natural Resources (15), Ministry of Meteorology and Geo-hazards (11), Office of the Auditor General (4), Police Department (11), Prime Minister Office (12), Public Works Department (8); the remaining 18 individuals were from the private sector (Air Vanuatu (6), Daily Post Newspaper (6), Telecom Vanuatu (6)). The majority (99%) of participants were of Ni-Vanuatu decent, whilst 1% were from other Pacific islands (e.g. Fiji). The selection criteria were that the participants are able to walk and also desired to partake in the programme. In order to involve a large group that can benefit from the study’s health effects, no further exclusionary criteria were set. The sample of this study is not representative for the entire population of Vanuatu, but results can be generalized to urban female, office-based employees. 133 individuals completed the programme and provided follow up data. Pregnant participants were excluded from analysis, leaving a total of 125 individuals for data analysis. The youngest participant was 21 years old, whilst the oldest was 55 years old (36.3 ± 8.3). The majority of the sample was either overweight (33%) or obese (46%). 18% were normal weight and 3% were underweight. Mean BMI was 29.6 ± 5.7; mean waist circumference was 96.0 ± 15.0 cm. This pre-experimental study presents an intervention lasting twelve weeks in duration. The intervention was implemented in the Vanuatu Government sector in Port Vila, Vanuatu. Participants underwent pre- and post-health screenings (week 0, week 15) measuring PA levels (steps), anthropometric measures, BP, and blood samples for determination of fasting serum glucose (mmol/l) and blood lipid (mg/dl) parameters. For the duration of twelve weeks, participants were encouraged to increase their PA levels, which were measured by pedometers. Wokabaot Jalens, designed in collaboration with local health practitioners and participants, is described in full detail elsewhere.35 Briefly, Wokabaot Jalens is a 12-week healthy lifestyle intervention based on the simple premise that walking can be increased gradually during the day at work, at home and during leisure time. Participants were asked to form groups of five participants. In reality, group sizes varied from three to seven group members. A total of 40 teams competed – on a fun basis – against each other with the overall aim of walking enough kilometres to virtually traverse the islands of Vanuatu. A step captain was appointed for each team, and over the twelve weeks of monitored intervention, step captains arranged weekly team meetings and exercise activities. All participants received electronic health information that accompanied Wokabaot Jalens on a weekly basis. Content included information on the benefits of an active and healthy lifestyle, suggestions for cost-effective approaches of healthy family lifestyle behaviour, ideas for locally attractive healthy shopping and cooking ideas, and motivational messages for the uptake of regular physical activities. The content emphasized the involvement of the external environment (i.e. family and communities). Participants were further equipped with a daily walking log book, an elastic waist band to secure the pedometer, culturally sensitive health brochures as well as charts for self-monitoring daily steps. During the study’s fully monitored 12-week phase, participants were required to use their pedometers and calendars for goal-setting and self-monitoring. Participants received a walking log to record daily step numbers, and were asked to complete the log at the end of each day for the duration of the intervention. Each step captain emailed each team members’ weekly step number to the researcher and each team’s step number was adjusted to a team of five participants. Mean steps/day were calculated and a step overview was provided. The study hypothesised that Wokabaot Jalens would increase participants’ PA levels and improve health indicators in those with poor baseline health data. In addition to the primary outcome (measured steps/day), programme effects on health parameters were also measured (waist circumference (cm), BP (mmHg), fasting serum glucose (mmol/l), cholesterol levels (mg/dl)). This study investigates two effects: the first part tested for modifications in objectively measured PA behaviour; the second part analysed the intervention’s effect on health measures. The Auckland University of Technology University Ethics Committee approved the study. The primary outcome was a change in step numbers, which was measured by Yamax SW-200. The Yamax SW-200 has been shown to be accurate and reliable for measuring step numbers in adults.36 Secondary outcomes were changes in waist circumference (cm), fasting serum glucose (mmol/l), lipid profile (mg/dl) and blood pressure (BP) (mmHg). Participants were assessed at baseline and after 15 weeks. Although the Wokabaot Jalens had terminated after 12 weeks, the additional three weeks were maintained to investigate whether independent changes were sustained after programme termination. The researcher, with the assistance of the Ministry of Health personnel, managed and carried out the health assessments. Importantly, staff aided with local language expertise in filling out lifestyle questionnaires. After the accurate pedometer placement and use was demonstrated, baseline PA levels (steps/day) were assessed prior to the monitored phase. Participants were instructed to wear pedometers during waking hours while engaging in usual activities for 24 hours a day. Scheduled health assessments were arranged for the collection of anthropometric and health indicator data prior to and following the monitored phase of Wokabaot Jalens. Each assessment was identical and included 1) PA levels (steps), 2) anthropometric measures (light clothing, no shoes), 3) BP, and 4) blood samples for determination of fasting serum glucose and blood lipid parameters. Changes in BMI, waist circumference (cm), BP (mmHg), fasting serum glucose (mmol/l) and blood lipids (mg/dl) were evaluated. BMI was calculated (kg/m2) using a portable digital scale measuring weight to the nearest 0.1 kg. A stretch-resistant fiberglass tape measure seamstress butterfly brand was used to measure height and waist circumference. Waist circumference was measured at the midpoint between the lower margin of the least palpable rib and the top of the iliac crest. Waist and hip girths were measured using standard protocols over light clothing. BP was measured twice (using OMRON, Automatic Blood Pressure Monitor, IA1B model). The 2nd reading was used for analysis. For the determination of fasting serum glucose tolerance, participants were asked to fast overnight. Serum glucose, high-density lipoprotein (HDL) cholesterol and triglycerides were determined using the CardioChek® PA system. The study used inferences based on magnitude for data analysis in order to quantify the magnitude of the effects, rather than simply identifying the presence or absence of effects. Effect sizes were calculated using the unequal-variance t-statistic to identify the effect on health indicators and to understand programme effectiveness. This also allowed covariate inclusion to calculate the differences in changes of each variable mean between the timeframe 0-15 weeks.37 Interpretation was based on confidence limits. An advantage of the magnitude based inference approach over the use of p-values is the guaranteed conclusion of the analysis. Effects can be either clear or unclear. Where unclear effects are found, sample sizes were not large enough and more data is needed to draw accurate conclusions about the effect. As such, the magnitude based inference approach also indicates the appropriateness of sample sizes. Differences for high-risk and “normal” groups were investigated for the effects of step numbers, waist circumference (cm), systolic blood pressure (SBP; mmHg), diastolic blood pressure (DBP; mmHg), blood serum glucose (mmol/l), high-density lipoprotein (HDL; mg/dl)) and triglycerides changes (mg/dl). The baseline value of each variable was included as a covariate to minimise confounding by the phenomenon of regression to the mean.37 All the variables were log-transformed with outcomes expressed both as percentages and raw units. Uncertainty in statistics is shown as 90% confidence limits. 90% confidence limits were used as they contain much of the information (90%), without being too broad. Inferences were made based on the probabilities of harm and benefit of each effect. Magnitude inferences were as follows: a clinically clear beneficial effect was almost certainly not harmful (<0.5% risk) and at least possibly beneficial (>25% chance); an unclear effect was at least possibly beneficial (>25%) with an unacceptable risk of harm (>0.5%); the effect was otherwise clearly trivial or harmful, depending on which outcome had the greater probability. The quantitative probabilities are not shown, but the qualitative terms were applied to each clear effect with its qualitative magnitude (e.g., likely small benefit). Conclusions are based on inferential statistics that emphasise precision of estimation rather than null hypothesis testing.39 All data are presented as mean ± SD unless otherwise stated. 207 individuals registered for the programme and provided baseline data. Those who completed both assessments (n=133, 64%) recorded twelve weeks of step/day data and attended the final health assessment after 15 weeks. Partial completers, programme dropouts and pregnant participants were excluded from data analysis. Partial completers and dropouts were vindicated with lack of motivation, lack of time, staff turnover and frequent travelling. A total of 14 individuals reported a lost or broken pedometer and were not able to continue the programme. Further, 74 participants did not attend the 2nd health assessment and were excluded from data analysis. The mean age for the 74 individuals who did not attend the 2nd health screening was 36 years. Of these, 30% were classified as normal weight, whilst 26% were classified as overweight and 27% as obese. Whilst 41% were classified as sufficiently active, 18% were classified as active and 23% classified as highly active. Mean baseline step data for these individuals was slightly higher (10,650 steps) than mean baseline step data for all completers (9,164 steps). Those individuals who provided data for both health screenings. Those individuals who provided data for both health screenings (week 0, week 15) were categorised as low risk (LR) or high-risk (HR) for each variable, depending on whether their values exceeded certain thresholds or not. Thresholds were based on literature and/or official guidelines that identified high risk cut-off points. These cut off values have been defined by experts in their respective fields. Although reference is made to non-Pacific populations, I believe that thresholds that were defined in international contexts are more appropriate than no cut-off values. Further, these cut-off values are in line with WHO thresholds used during national STEPS surveys. Variables included PA (<5,000 steps),40 waist circumference (>88cm),41 SBP (>140 mmHg),42,43 DBP (DBP, >90 mmHg),42,43 fasting serum glucose (>6.1mmol/L),44 HDL (>40mg/dl)45 and triglycerides (>200 mg/dl)45 Changes in these variables over the course of the intervention on three groups are presented: 1) all participants, 2) LR individuals and 3) HR individuals. Table 1 indicates that PA levels increased by 26% for all participants (90% confidence limits ± 11%). Mean daily step count (mean ± SD) was 9,160 ± 3,780 at baseline and 11,680 ± 5,780 at follow-up. For all programme completers, there was a most likely small beneficial increase of 2,510 ± 6,920 on the number of steps. Adjustments for age did not alter programme effects. Changes in all other variables measured for the periods 0-12 weeks are shown in Table 1. Changes in DBP, HDL and triglycerides did not track in their anticipated direction, all of them showing harmful outcomes. DBP increased by 4% representing an effect that is likely small and harmful. HDL levels decreased by 18% showing possibly moderate harmful effects, whilst triglycerides levels increased by 32% representing most likely harmful effects. A harmful effect on DBP and the harmful decrease in HDL levels was detected in low-risk individuals only. 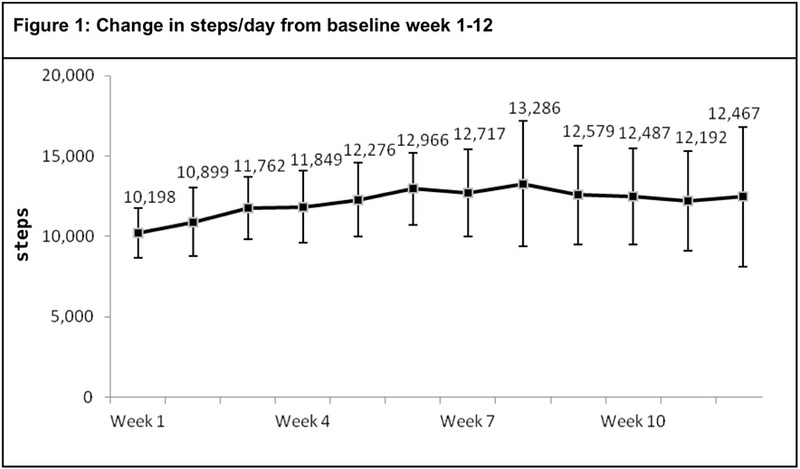 Figure 1 shows the mean total steps per day on a week-to-week basis from week 0 until week 12. Data from 116 participants were used and adjusted to daily step numbers. Overall, a mean step increase of 2,510 steps was detected by week 12. A peak of mean step numbers was reached after week 8. The duration to reach an average step number of 1,000 steps more than usual was three weeks. During the first six weeks, the mean change in steps per day was 2,770 steps. Table 2 visualises the effect of PA behaviour on the specific NCD risk factors. For example, the PA effect on waist circumference in high-risk individuals is likely beneficial. For all other NCD risk factors, insufficient data is available to understand effects of PA in high-risk individuals. The PA effect is deemed unclear. 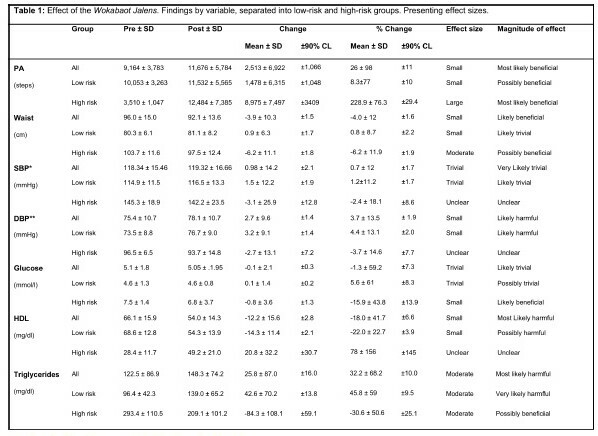 Interestingly, Table 2 demonstrates the beneficial effect of PA behaviour in low-risk individuals (waist circumference, SBP, DBP, glucose, HDL and triglycerides). It is important to acknowledge the limitations in step data analysis. Clearly, step data do not represent total PA. Pedometers do not measure intensity, frequency and duration. However, step data gives an indication of total PA, particularly in contexts where walking is the most popular mode of PA and where vigorous PA is rather uncommon. 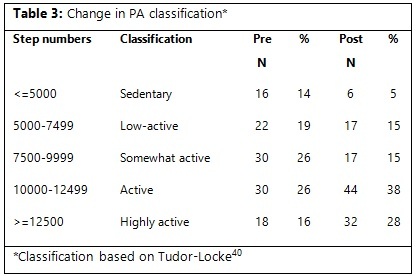 Based on the PA classification provided by Tudor-Locke, positive changes in step categories were detected (Table 3). Importantly, whilst 14% were classified as being sedentary at baseline, this number has come down to 5% at follow up. 38% were classified as being active after the 12-week programme (as opposed to 26% before the programme). The health effect of the intervention on LR individuals did not always track in the anticipated direction. Trivial (waist circumference, SBP, serum glucose) and harmful (DBP, HDL, triglycerides) effects were encountered. 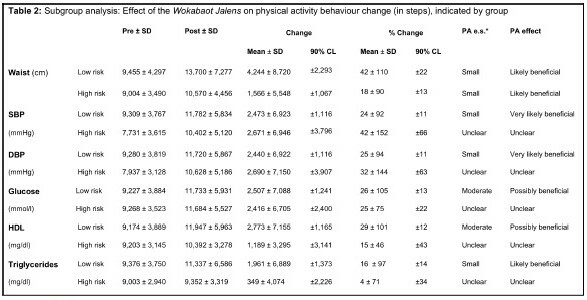 Importantly, PA behaviour showed possibly beneficial effects with a percent change of +8.3%. Interestingly, the LR group on waist circumference showed the strongest percent change in PA behaviour with +35.9%, representing a small likely beneficial effect. The majority of individuals were classified as HR for at least one variable. In detail, 84 individuals were classified as HR for waist circumference, 23 were classified as HR for fasting serum glucose, 13 were classified as HR for SBP, 11 were classified as HR for DBP and 15 were classified as HR for PA. The HR PA group experienced the strongest increase in PA behaviour with a percent change of +229% representing a large most likely beneficial effect. A subgroup analysis indicates that the change in PA behaviour is larger in the HR SBP group (+35%) and in the HR DBP group (+34%) than the overall PA increase (+26%). Importantly, data analysis indicates substantial effects on metabolic indicators for HR individuals: The HR HDL group experienced an increase in HDL levels of 79%. Further, the HR waist circumference group showed a decrease of waist circumference by 6%, representing a moderate possibly beneficial effect. Both SBP and DBP decreased for HR, showing unclear effects. A small likely beneficial effect on fasting serum glucose (-16%) was detected. Whilst mean triglycerides increased for the LR group, they decreased in the high risk group by 31%, representing a moderate possibly beneficial effect. Whilst data do not allow to draw conclusions for the entire population of Vanuatu, findings do give an indication of baseline step counts from Ni-Vanuatu female civil servants. The purpose of this study was to evaluate a PA programme that was designed for Pacific women in urban Vanuatu. Overall, findings indicate a successful lifestyle change programme that had beneficial effects on PA behaviour and on some health indicators, particularly in high-risk individuals. Findings were mostly consistent with those from other research. Overall, the use of pedometers were found to be associated with substantial increases in PA, at least in the short term.21,46,47 A systematic review investigated the effect of pedometers on PA levels, studying 26 interventions. Baseline step numbers from the participants were higher (9,164 ± 3,787) than in other studies (7,029 + 3,100).48 This is probably related to the different living conditions and less car ownership in Vanuatu. Findings from other populations indicate a small decrease in BP through pedometer-based PA interventions.21 A small change at the whole group level was observed. Importantly, mean BP dropped in the high-risk group by -2.4% (SBP) and -3.7% (DBP). The effect was unclear due to a small sample size in high-risk BP group. Findings indicate that 26% of the sample met the Pacific PA recommendations (>10,000 steps) and only 14% were classified as sedentary (<5,000 steps) prior to intervention. The wider implication of this finding is that due to the high mean baseline step number, the promotion of an additional daily 3,000 steps or 30-minutes of moderate-intensity PA is more feasible than the promotion of 10,000 steps/day in this context. The harmful effect on DBP may be related to white coat hypertension and an increased nervousness upon arrival; to the increased number of participants walking (in the heat) to where the follow-up study took place 15 minutes post-arrival; or to measurement error. Whilst pedometer-based PA interventions have shown to be effective in the short run, long-term strategies are lacking.40,52 Due to staff turnover in the host country and limited funding options, the sustained effect of this intervention remains unknown. Knowledge gained from this outcome evaluation includes the understanding that team-based pedometer PA programmes can be successful in engaging urban Ni-Vanuatu women in PA. The suppzoo phen375 guide and the programme helped keep healthy individuals at low-risk and improve health risks among high-risk participants. Some modest weight loss was experienced. There is inevitably a gender bias because the objective of this study was to investigate the effect of the intervention in adult women, and so the results cannot be used to draw conclusions for men. Additionally, there is a selection bias because a large majority of participants (98.9%) in this study were Ni-Vanuatu, and results may not be consistent across other PICs. Furthermore, the study includes a social bias: only employed civil servants took part in the intervention and it is not clear whether similar effects are true for unemployed female civil servants. Individuals who did not attend the follow-up health screening were excluded from analysis, creating an exclusion bias. From field experience, we assume that urban residents of Melanesia tend to be more physically active than their neighbours from Polynesia due to the less advanced infrastructure: whilst the use of cars and buses for transport is more affordable in Apia (Samoa) or Nuku’alofa (Tonga), walking is a more common mode of transport in Vanuatu. However, evidence for this observation is lacking. The Ministry of Health of Vanuatu recruited the study’s participant sample and thus participants were not randomly chosen from the population. It is also important to note that the sample was a self-selected group of volunteers. The possibility of prior motivation for behaviour change must not be overlooked. Further, findings are limited because of the lack of a control group and it remains unclear whether external programmes (TV advertisements, newspaper, other sport programmes) contributed to the increase in PA behaviour. Future research is needed to determine whether lifestyle changes have been maintained in the long-term. Similar research approaches to assess the effect of such interventions on male individuals can improve the understanding around local PA behaviour in greater detail. A comparison or urban/rural pedometry data may aid in the process of defining local and more traditional lifestyle behaviour. Finally, more research on Pacific PA policy is strongly encouraged in order to respond to the lack of evidence in the region. Funding for this study was provided by the World Health Organization South Pacific Office. Tables of the results of all analyses are available upon request from the first author. NOTE: Although the author is part of the JSFD editorial team, she was excluded from the reviewing and editing processes for this manuscript to avoid any conflicts of interest. Edwards B, Frizelle F. Globalisation and its impact on the South Pacific. Journal of the New Zealand Medical Association. 2009;122(1291):10-13. Colagiuri R, Win Tin ST. Diabetes in Nauru: the price of economic wealth and westernization. DiabetesVoice. 2009;54(1):37-39. Hughes RJ, Lawrence A. Globalization, food and health in Pacific Island countries. Asia Pacific Journal for Clinical Nutrition. 2005;14(4):298-306. Secretariat of the South Pacific (SPC), World Health Organization Regional Office for the Western Pacific (WPRO). Pacific NCD Forum Report. Noumea; 2010. http://www.spc.int/hpl/. Falconer DG, Buckley A, Colagiuri R. Counting the cost of type 2 diabetes in Vanuatu. Diabetes Research and Clinical Practice. 2010;87(92-97). Wild S, Roglic G, Green A, Sicree R, King H. Global Prevalence of Diabetes: Estimates for the year 2000 and projections for 2030. Diabetes Care. 2004;27(5). World Health Organization (WHO). Preventing chronic diseases: a vital investment: WHO global report. Geneva; 2005. http://www.who.int/chp/chronic_disease_report/en/. World Health Organization (WHO). Global status report on noncommunicable diseases 2010. Geneva; 2010. Vanuatu National Statistics Office. 2009 National Census of Population and Housing: Vanuatu Hemi Kaontem Yu. Summary Release. Port Vila, Vanuatu; 2009. Dancause KN, Dehuff C, Soloway LE, et al. Behavioral changes associated with economic development in the South Pacific: Health transition in Vanuatu. American Journal of Human Biology. 2011;23(3):366-376. Yamamoto TS, Sunguya BF, Shiao LW, Amiya RM, Saw YM, Jimba M. Migration of Health Workers in the Pacific Islands: A Bottleneck to Health Development. Asia-Pacific Journal of Public Health. 2012;(PMID: 22815302). Doran C. Economic impact assessment of non-communicable diseases on hospital resources in Tonga, Vanuatu and Kiribati: Pacific Action for Health Project; 2005. Haskell WL, Lee I-, Russell R. P., et al. Physical Activity and Public Health: Updated Recommendation for Adults From the American College of Sports Medicine and the American Heart Association. Circulation: Journal of the American Heart Association. 2007;116(9):1081-1093. U.S. Department of Health and Human Services. Physical Activity Guidelines Advisory Committee Report. Washington D.C; 2008. http://www.health.gov/paguidelines. Accessed August 15, 2010. Wareham N. Physical activity and obesity prevention. Obesity Reviews – an official journal of the International Association for the Study of Obesity. 2007;8 (Suppl. 1):109-114. Ezzati M, Lopez AD, Rodgers A, Murray CJL, eds. Comparative quantification of health risks: Global and regional burden of disease attributable to selected major risk factors. [Physical inactivity (pp 729-883)]: World Health Organization (WHO); 2004; 1. World Health Organization (WHO). A framework to monitor and evaluate implementation: Global strategy on diet, physical activity and health (2004). 2nd ed. Geneva, Switzerland; 2008. Simon P, Gonzalez E, Ginsburg D, Abrams J, Fielding J. Physical activity promotion: a local and state health department perspective. Preventive Medicine. 2009;49(4):297-298. Haskell WL, Blair SN, Hill JO. Physical activity: health outcomes and importance for public health priority. Preventive Medicine. 2009;49:280-282. Ministry of Health Vanuatu, World Health Organization for the Western Pacific Region (WPRO). Vanuatu STEPS Survey 2011: Factsheet. Suva, Fiji; 2011. Bravata DM, Smith-Spangler C, Sundaram V, et al. Using Pedometers to Increase Physical Activity and Improve Health. A Systematic Review. Journal of the American Medical Association. 2007;298(19):2296-2304. Hatano Y. Use of the pedometer for promoting daily walking exercise. International Council for Health, Physical Education, and Recreation. 1993;29:4-8. World Health Organization for the Western Pacific Region (WPRO), Secretariat of the Pacific Community (SPC). Pacific Physical Activity Guidelines for Adults: Framework for accelerating the communication of physical activity guidelines. Manila; 2008. http://www.wpro.who.int/NR/rdonlyres/…/PAG_layout2_22122008.pdf. Tudor-Locke C, Craig CL, Brown WJ, et al. How Many Steps/day are Enough? For Adults. International Journal of Behavioral Nutrition and Physical Activity. 2011;8(1):79. Cook I. Debate. How should steps per day be reported-a proposal using data from Africa. Int J Behav Nutr Phys Act. 2012;9(1):7. Janer G, Sala M, Kogevinas M. Health promotion trials at worksites and risk factors for cancer. Scandinavian Journal of Work, Environment and Health. 2002;28(3):141-157. Quintiliani L, Sattelmair J, Sorensen G. The workplace as a setting for interventions to improve diet and promote physical activity: Background paper prepared for the WHO/WEF Joint Event on Preventing Noncommunicable Diseases in the Workplace (Dalian/ China, September 2007). Geneva, Switzerland; 2008. World Health Organization (WHO). Workplace Health Promotion. http://www.who.int/occupational_health/topics/workplace/en/print.html. Bastos J, Araujo C, Hallal P. Prevalence of insufficient physical activity and associated factors in Brazilian adolescents. Journal of Physical Activity and Health. 2008;5(6):777-94. World Health Organization (WHO). Ottawa Charter on Health Promotion: International Conference on Health Promotion. Geneva; 1986. http://www.who.int/hpr/NPH/docs/ottawa_charter_hp.pdf. WHO, UNDCP, EMCDDA. Workbook 7: Outcome evaluations. Geneva; 2000. Speller V. 2h – Principles and Practice of Health Promotion: Evaluation of health promotion, public health or public policy interventions. [Public Health Action Support Team]. Bucks, U.K; 2011. Siefken K, Schofield G, Schulenkorf N. Process Evaluation of a Walking Programme Delivered through the Workplace in the South Pacific Island Vanuatu. In press with Global Health Promotion. 2014. Nutbeam D, Bauman A, eds. Evaluation in a Nutshell: A Practical Guide to the Evaluation of Health Promotion Programs: McGraw-Hill Book Company Australia; 2006. Siefken K, Schofield G. Wokabaot Jalens: A workplace healthy lifestyle intervention for female civil servants in Port Vila, Vanuatu, 2011. [Report for the World Health Organization]. Auckland, New Zealand; 2011. Crouter S, Schneider P, Karabulut M, Bassett D. Validity of 10 Electronic Pedometers for Measuring Steps, Distance, and Energy Cost. Medicine & Science in Sports & Exercise. 2003;35(8):1455-1460. Hopkins W. Linear Models and Effect Magnitudes for Research, Clinical and Practical Applications. Sportscience. 2010;14:49-57. Hopkins W. Spreadsheets for Analysis of Controlled Trials, with Adjustment for a Subject Characteristic. Sportscience. 2006;10:46-50. Hopkins W, Marshall S, Batterham A, Hanin J. Progressive Statistics for Studies in Sports Medicine and Exercise Science. Medicine & Science in Sports & Exercise. 2009;41(1):3-13. Tudor-Locke C, Bassett DR. How Many Steps/Day Are Enough? Preliminary Pedometer Indices for Public Health. Sports Medicine (Auckland, N.Z.). 2004;34(1):1-8. Han T, van Leer E, Seidell J, Lean M. Waist circumference action levels in the identification of cardiovascular risk factors: prevalence study in a random sample. British Medical Journal. 1995;311(7017):1401-1405. Stamler J, Stamler R, Neaton J. Blood Pressure, Systolic and Diastolic, and Cardiovascular Risks: US Population Data. Archives of internal medicine. 1993;153(5):598-615. World Health Organization (WHO). 2003 World Health Organization (WHO)/International Society of Hypertension (ISH) statement on management of hypertension. Journal of Hypertension. 2003;21(11):1983-1992. World Health Organization (WHO), International Diabetes Federation (IDF). Definition and Diagnosis of Diabetes Mellitus and Intermediate Hyperglycaemia: A report of a WHO / IDF Consultation. Geneva; 2006. Murray A, Cluett C, Bandinelli S, et al. Common lipid-altering gene variants are associated with therapeutic intervention thresholds of lipid levels in older people. European Heart Journal. 2009;30(14):1711-1719. Moreau KL, Degarmo R, Langley J, et al. Increasing daily walking lowers blood pressure in postmenopausal women. Medicine and Science in Sport and Exercise. 2001;33(11):1825-1831. Sugiura H, Sugiura H, Kajima K, Mirbod SM, Iwata H, Matsuoka T. Effects of long-term moderate exercise and increase in number of daily steps on serum lipids in women: randomised controlled trial. BMC Women’s Health. 2002;2(3). Chan CB, Ryan DAJ, Tudor-Locke C. Health benefits of a pedometer-based physical activity intervention in sedentary workers. Preventive Medicine. 2004;39:1215-1222. Merriam-Webster. White Coat Hypertension. http://www.merriam-webster.com/medical/white%20coat%20hypertension. Carlot-Tary M, Hughes R, Hughes MC. 1998 Vanuatu Non-Communicable Disease Survey Report. [Health Department, Government of the Republic of Vanuatu]. Port Vila, Vanuatu; 2000. Parks E, Krauss R, Christiansen M, Neese R, Hellerstein M. Effects of a low-fat, high-carbohydrate diet on VLDL-triglyceride assembly, production, and clearance. The Journal of Clinical Investigation. 1999;104(8):1087-1096. Coghill N, Cooper A. Motivators and de-motivators for adherence to a program of sustained walking. Preventive Medicine. 2009;49:24-27.